In 2011, an earthquake off the coast of Japan set in motion a series of events that allowed radiation to escape from the Fukushima Daiichi Nuclear Power Plant. The radioactive contaminants that were released have long-term implications for residents both locally and globally. Figure 1. Members of the International Atomic Energy Agency’s (IAEA) Remediation Expert Mission examines Reactor Unit 3 during the team’s visit to the Fukushima Daiichi Nuclear Power Plant. Photograph by Giovanni Verlini, 2011. CC BY-SA 2.0. The Fukushima Daiichi Nuclear Power Plant (Figure 2) is one of the foremost power generation sites for the Fukushima prefecture in Japan (Figure 3). In 2011, an earthquake off the coast of Japan caused major havoc for the residents inhabiting the coastal area. This destruction was a result of the tsunami created by the earthquake. The tsunami overwhelmed levees protecting the Fukushima Daiichi Nuclear Power Plant and flooded the basement levels of the facility. These levels housed the backup generators for the cooling systems at the plant. The destruction of the backup generators caused default cooling systems to go offline, and forced the Tokyo Electric Power Company to take drastic measures to prevent a catastrophic nuclear meltdown. The Tokyo Electric Power Company opted to open intakes and pump seawater into the reactors. At the time this seemed like a good alternative, however there was no system to store the contaminated water shortly after this cooling technique was implemented. With nowhere to go, the contaminated water was released, resulting in radioactive material dispersion into the ocean, surrounding land, and the atmosphere. 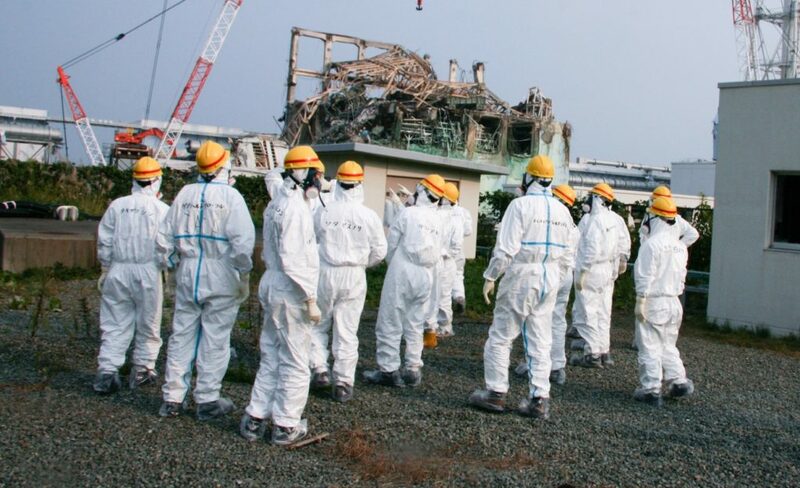 Predictably, this can cause major, far-reaching effects despite the assurances made by parties associated with the Fukushima Daiichi Nuclear Power Plant. The original estimations of contamination levels were high enough to warrant concern.1 The levels of radiation cited in the most conservative estimates warranted the investigation of the actual dispersion of radiation and its effects. To explore and examine these far-reaching effects, quantitative data was gathered and analyzed. Researchers relied on a network of noble gas monitoring stations located around the globe to obtain information on radionuclides released into the atmosphere.2 Two stations, located in Hong Kong and Tokyo, were specifically used to gather the data.2 These stations reported definitive increases in radioactive isotopes in the atmosphere, upwards of three degrees of magnitude compared to normal levels.2 Researchers further determined that these increases in radionuclides are correlated with the release of material from the Fukushima Daiichi plant.2 The Hong Kong detector which is located over three thousand kilometers from the Fukushima Daiichi site detected an increase in radionuclides. Detectors often have spikes in concentrations of radionuclides shortly after explosions or the release of smoke from the reactors. Thus, the correlation of increased radionuclides from the Fukushima Daiichi plant disaster was easily established. Figure 3. 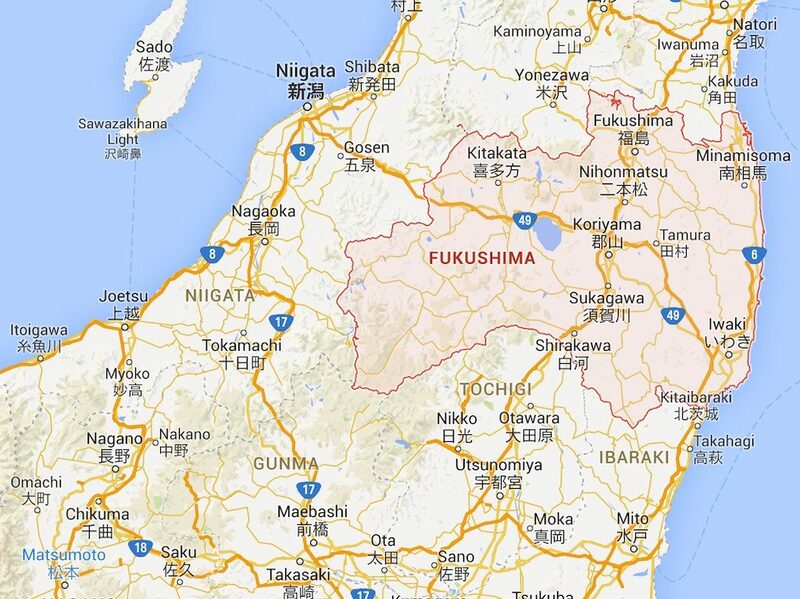 Google Map of Fukushima Prefecture, Japan. The Fukushima Prefecture is a state-like region within Japan. The Fukushima Daiichi Power Plant provided electrical power to this region. Map data ©2015 Google. Public Domain. Click Here to Explore Fukushima in Google Maps. This data suggests the potential for contamination released by the Fukushima Daiichi Power Plant to travel vast distances. To further investigate the spread of contamination, researchers used computer models of air currents to map the distribution across the globe. Researchers used a similar method to also map the dispersion of radionuclides released into the ocean by using models of ocean currents. Both models predicted extensive distribution in a short amount of time. Contaminants in the atmosphere were predicted to spread around the world (Figure 4), while contaminants in the ocean would traveling as far as the coast of California. Researchers also stated that the concentration of radionuclides in the northwestern region of the Pacific Ocean, at the highest predicted values, would reach levels comparable to a nuclear weapons test. model, by Povinec et al. 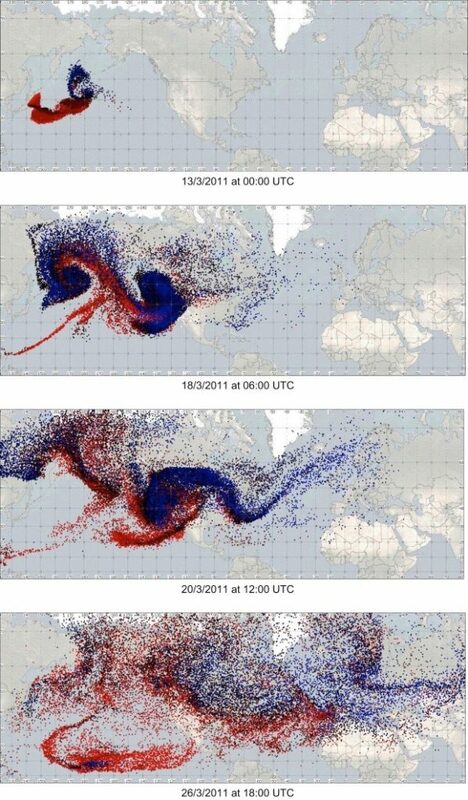 (2013), describes how air currents dispersed this material across the world. Courtesy of Povinec et al., 2013. Reprinted with permissions from Elsevier. Another issue related to these contaminants is their storage in the mountainous regions located near Fukushima Daiichi. The root structures of trees in the forests cover upwards of 85 percent of these mountainous areas, and this inhibits the distribution of contaminated material due to slower soil erosion rates. Because of this limited erosion, it can be deduced that the radioactive material will be stored for a longer period, and have a more prolonged release in these regions. Also, different materials can absorb different concentrations of radionuclides, which can result in some areas having higher contamination. Hypothetically, this could cause a major environmental issue if these highly radioactively contaminated areas were hit by a monsoon and a large amount of radionuclides were released at once. Overall, the short-term ramifications of the Fukushima Daiichi disaster has left many concerns for both local and global populations. The long-term effect of the radioactive contamination leaves the surrounding land uninhabitable. More far-reaching environmental effects will likely occur as a result of this disaster. Chino, M. et al. (2011). Preliminary estimation of release amounts of 131I and 137Cs accidentally discharged from the Fukushima Daiichi nuclear power plant into the atmosphere. Journal of Nuclear Science and Technology, 48(7): 1129-1134. Schoppner, M. et al. (2013). Estimation of the radioactive source dispersion from Fukushima nuclear power plant accident. Applied Radiation and Isotopes, 81, 358-361. Povinec P, et al. (2013). Dispersion of Fukushima radionuclides in the global atmosphere and the ocean. Applied Radiation and Isotopes, 81:383-392. Wang H, et al. (2012). Numerical study and prediction of nuclear contaminant transport from Fukushima Daiichi nuclear power plant in the North Pacific Ocean. Chinese Science Bulletin, 57(26):3518 – 3524. Chen J. (2013). Evaluation of radioactivity concentrations from the Fukushima nuclear accident in fish products and associated risk to fish consumers. Radiation Protection Dosimetry, 157:1-5. Yasunari, T.J. et al. (2011). Cesium-137 deposition and contamination of Japanese soils due to the Fukushima nuclear accident. Proceedings of the National Academy of Sciences, 108(49):19530-19534. Evrard, O. et al. (2013). Evolution of radioactive dose rates in fresh sediment deposits along coastal rivers draining Fukushima contamination plume. Scientific Reports, 3:3079. Tilman A.R. (2013) A Public Health Perspective on the Fukushima Nuclear Disaster, Asian Perspective, 37:523-549. Ishii T, et al. (2013). A report from Fukushima: an assessment of bone health in an area affected by the Fukushima nuclear plant incident. Journal of Bone and Material Metabolism, 31(6):613 – 617. Verlini, Giovanni. (2011). Visit to the Fukushima Dai-ichi Nuclear Power Plant. [Photograph]. Retrieved from IAEA Imagebank via FlickrCommons. CC BY-SA 2.0. Theanphibian. (2011). Pronounce Fukushima Daiichi. Retrieved from Wikimedia Commons. Public Domain. Applied Radiation and Isotopes, 81, P.P. Povinec,M. Gera,K. Holý,K. Hirose,G. Lujaniené,M. Nakano,W. Plastino,I. Sýkora,J. Bartok,M. Gažák, Dispersion of Fukushima radionuclides in the global atmosphere and the ocean, 389, (2013), with permission from Elsevier.